Can you help North Yorkshire Police to trace the person pictured in these CCTV images? Two trailers worth £2,700 have been stolen from a North Yorkshire Moors National Park depot in Castleton. North Yorkshire Police today released CCTV images of a person they would trace following the thefts on Tuesday. One of the two trailers stolen from the depot. The trailers were stolen from a side yard of the depot at around 9pm. The smaller trailer is a 6ft x 4ft Ifor Williams Trailer model P6E and the larger trailer is an 8ft x 4ft Ifor Williams Trailer model GD84. 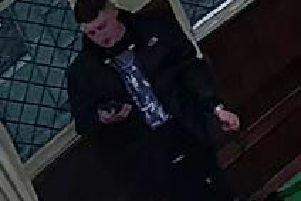 A spokesman said: "Police would like to speak to the person pictured in the CCTV stills as they may have important information that could assist the investigation." Anyone who recognises him or who has any information that could help to locate the trailers is asked to email David.Laverick@northyorkshire.pnn.police.uk or call 101, select option 2 and ask for David Laverick. The second trailer taken from the depot in Castleton. Please quote the North Yorkshire Police reference number 12170200613.